Llanbedr: Accommodation, Attractions, Activities, Going Out, Shopping, Things to Do, Places of Interest, Outdoors, Llanberis Holidays, Llanberis Area Location, North Wales. Nestled between the Rhinog mountains and the white sandy beaches of the Cambrian coast, lies the popular and unique village of Llanbedr; a village in the Ardudwy area of Gwynedd. There are many attractions in Llanbedr, the stunning Nantcol Waterfalls, Llanfair Slate Caverns and Linda John Gallery. The Morfa Dyffryn sand dunes and Mochras (Shell Island) are also nearby. 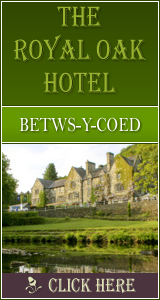 Llanbedr offers special atmosphere and it�s a traditional Welsh village that most tourists return to visit again. With busy local shops, pubs and restaurants, there�s plenty to do. The autumn in Llanbedr is colourful and glorious. In the spring there are Lambs, Bluebells and Rhododendrons. In the winter months there is snow on the mountain tops, a beautiful sight in the fresh and clear air. A mile from the village is the hamlet of Pentre Gwynfryn which has an ancient chapel, Capel Salem. The inside of this chapel was made famous by the painter Sydney Curnow Vosper who painted a member of the congregation, Si�n Owen, in traditional Welsh costume. Llanbedr has a disused airfield which was (until 2004) operated by the Defense Evaluation and Research Agency (DERA) and QinetiQ as a launch site for remotely-piloted drone �aircraft� for use as aerial targets by the RAF and other UK forces. Opposite the airport is one of two NACATC units (National Air Cadets Adventure Training Centres) in the UK (the other being in the village of Windermere in the English Lake District). At the southern entrance to the village is the former RAF complex Maes Artro which featured in the paranormal television series Most Haunted.